Welcome back and happy hockey season! We’re already gearing up for the TDSB/TFSS Day with the Toronto Marlies. Your students can join thousands of others to cheer on the Toronto Marlies at the Ricoh Coliseum on Wednesday, February 20th, 2019. 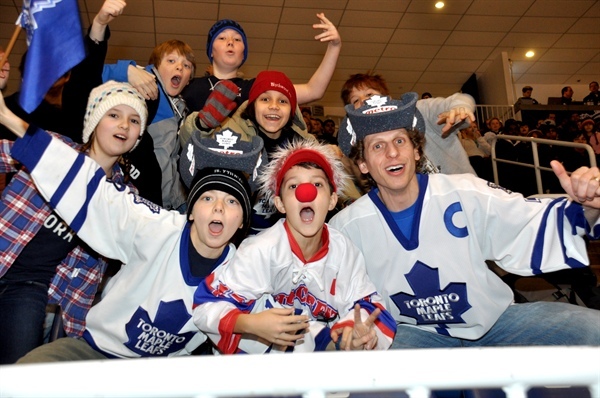 The Marlies have arranged for an 11:00 a.m. start time and reduced ticket prices. The event showcases our national sport and our top athletes encourage students to get active! Funds raised at this event will go towards your charity, the Toronto Foundation for Student Success (TFSS), to help students in need. Past school-day games have been complete sell-outs and schools had to be turned away. Register now so that you don’t miss out this year! Tickets can be held until Monday, December 3rd. If you have not paid for tickets at that point, we will release the ones you ordered so that other schools have the chance to attend. Don’t miss out on this great opportunity to learn about the importance of an active lifestyle, and to cheer on the Marlies! Email info@tfss.ca to order your tickets now! Marlies tickets are just $15 (regular value up to $53). One free adult supervisor ticket will be provided for every 15 paid tickets. Seats will be assigned on a first paid basis; the sooner you confirm payment, the better your seats. New this year, we are having two early-bird draws with MORE prizes! If you ordered and paid for your tickets by Monday, November 12th, your school is eligible for all of our experiences listed below. Future Starters: Ten students, five each from two schools, will enjoy a pre-game skate and line-up on the blue line with the players for the national anthems. Anthem Singers: The selected school will be able to wow the audience by singing the Canadian and American national anthems! Marlies Player Assembly: Two to three Marlies players will host an assembly at one lucky school! Marlies players would be happy to coordinate with the school to speak about important issues such as anti-bulling, active living etc. Duke The Dog Visit: Duke the Dog, the official Marlies Mascot, will spend an hour at one school! In the past he has gone from class to class, or he has participated in a school assembly. Flag Wavers: 20 students from one school will carry the Canadian flag on the ice and hold it for the national anthem. Fan Tunnels: 40 students, 20 each from two schools, will form a “human tunnel” for the players to pass by as they enter on their way to the ice at the start of each period. Zamboni Ride: During each intermission, one lucky TDSB student will co-pilot the Zamboni as it resurfaces the ice. Autographed Marlies Hockey Stick: Ever wanted a signed hockey stick? Here’s your chance! You can display it at the office or use it during sporting events to bring your school luck! Or, if you order and pay for your tickets by Monday, December 3rd, your school is eligible to participate in the Fan Tunnels, Flag Wavers, Zamboni Rides and Autographed hockey stick!